Experimenting with tiger farming is too risky and could drive wild tigers further toward extinction, the World Bank told a key international wildlife trade meeting today. 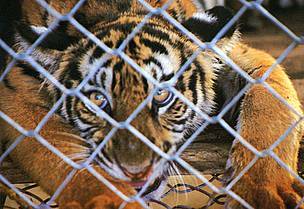 Geneva, Switzerland – Experimenting with tiger farming is too risky and could drive wild tigers further toward extinction, the World Bank told a key international wildlife trade meeting today. WWF endorsed the World Bank’s call for countries to ban tiger farming because of the uncertainty that it will have for the long-term conservation of wild tigers. “Stopping all trade in tiger parts, and phasing out these tiger farms, is of the utmost urgency if the tiger is to survive in the wild”, said Dr Susan Lieberman, Director of the Species Programme of WWF International, “It is time for the world community to join together, with tiger range state governments, to stop all poaching of tigers for illegal trade, and WWF welcomes the engagement of the World Bank in these efforts”. Because of the unpredictability of the market environment and the small number of remaining tigers in the wild, there is “no room for experimentation,” Varma, who leads the World Bank’s Global Tiger Initiative, said after the meeting. Tiger trade is prohibited internationally and banned domestically in all of its range countries, including China - historically the largest market for tiger products. However, owners of privately run tiger farms and a contingent of wealthy business men across China have been pressuring the Chinese government to allow legal trade in tiger parts within China and lift its domestic tiger trade ban, implemented in 1993. “Having carefully weighed the economic arguments we urge the CITES community to uphold the ban on wild tiger products and for all countries to continue to ban the domestic trade of wild tigers,” the World Bank statement said. “We also call upon the international community at large to join efforts in providing the necessary technical and other support to the respective countries in phasing out tiger farming. This is the only safe way to ensure that wild tigers may have a future tomorrow." Tiger is listed as as Critically Endangered in Vietnam's Red Book.